Screen porches and gazebos are popular additions for outdoor living. You can really get the best of both worlds by having an indoor/outdoor room. These structures typically have stricter code requirements than decks and can cost quite a bit more. Adding a porch roof over your deck can provide a space to enjoy the outdoors whether rain or shine. The most basic gable end porches will shed water and snow and create a sanctuary from the sun. Some designers add screen walls to preserve breezes while keeping mosquitoes at bay. Tongue and groove cedar is the perfect material to finish a vaulted porch ceiling. Vinyl or aluminum soffits can be outfitted to reduce maintenance. Some high-end porches even feature fans, canned light fixtures and cable TV. Gazebo structures can be built as standalone-enclosed areas beside outdoor decks. Octagon gazebos are popular and are usually built using cedar material. Screen windows, doors, trim molding and a variety of roof designs are available in easy-to-build kits. The size and style of your porch or gazebo depends largely on your lifestyle and your budget. A porch is simply defined as a deck with a serious roof that completely shields out rain and snow and is attached to the house. (Unattached roofed structures may be called gazebos or pavilions.) A porch may have open sides, be screened in, have windows or window storm panes that are installed for part of the year. A back porch is typically deck-like in size and shape, so it can accommodate elements like a dining table, spa, fireplace and perhaps a grill (if it can be vented outside). 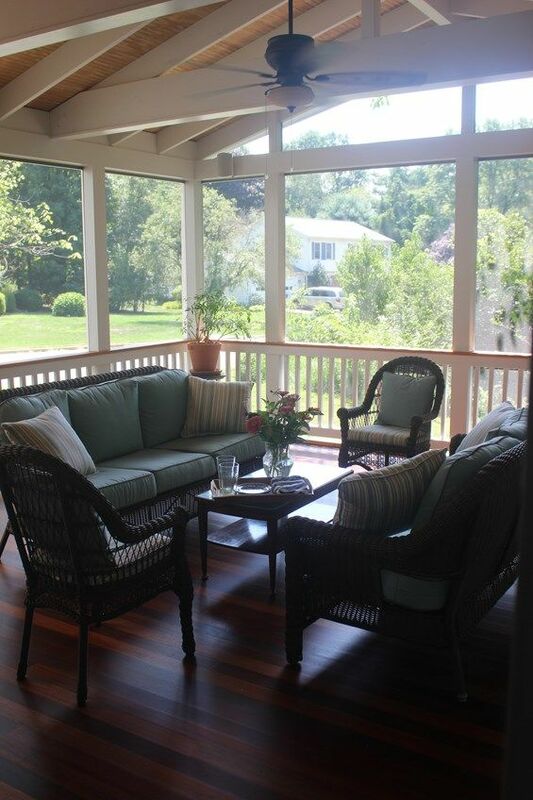 A front porch is often a fairly narrow space, with room for chairs and small tables. Although, this is not a hard-and-fast rule. The great attraction of a porch is that you can enjoy an outdoor setting even when the weather is imperfect or when mosquitos are swarming. For that reason, many deck builders tell us that customers are leaning more toward porches these days, and that porches have become a growing part of their businesses. 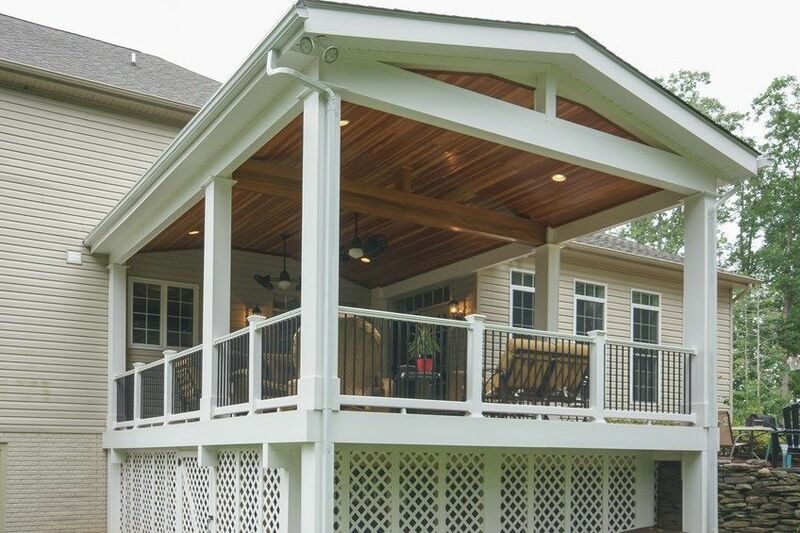 A porch roof also lets you add features that might not work on an open deck. For instance, you can have an overhead fan or light (perhaps the most popular porch feature), stereo speakers, a television and electrical outlets for appliances. A hot tub under a porch roof can be used just about any time. 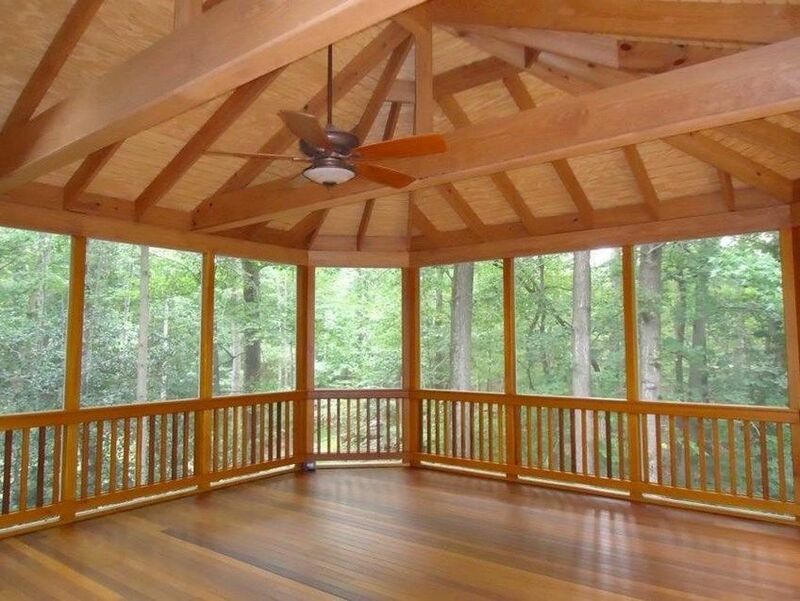 Consider building a porch roof over just part of a large deck. That way, you can stay in the open air when conditions are pleasant and retreat to a more protected location when things get uncomfortable. 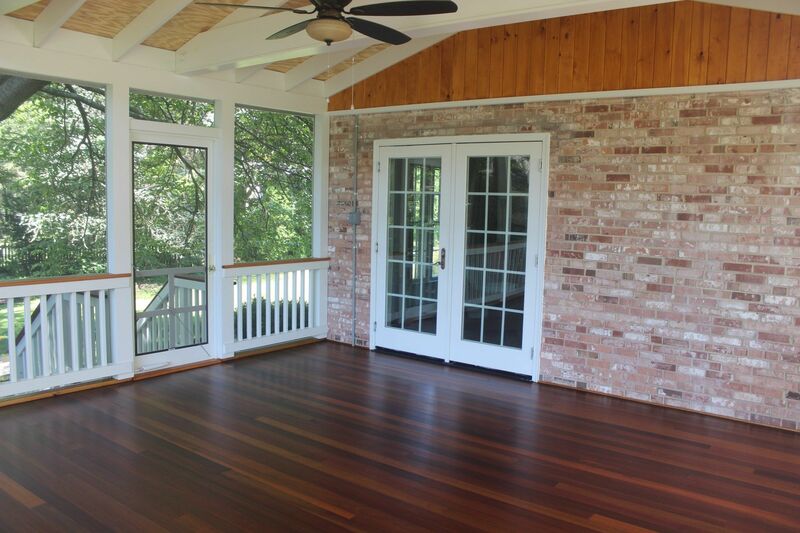 This backyard porch has a stunning roof that features a vaulted beadboard ceiling made of stained natural wood, as well as a thick beam in the middle. Recessed can lights and low-hanging fan/lights keep it well lit and cool. 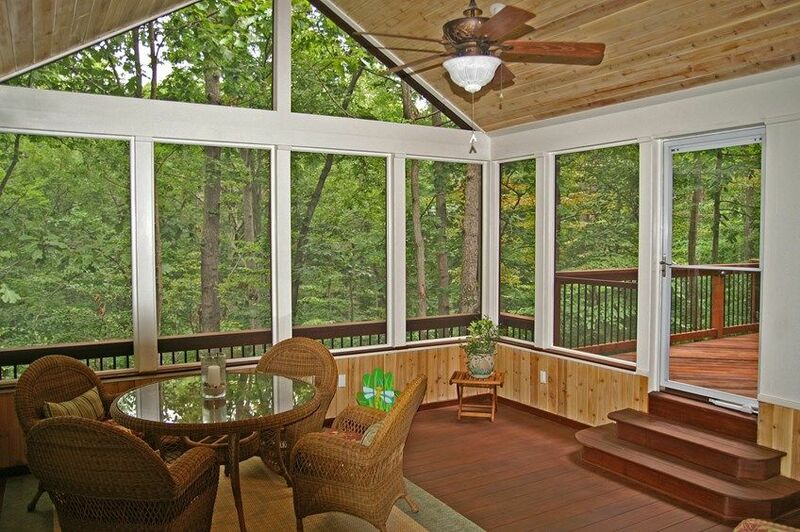 A fully screened porch keeps the bugs out. A house’s original brick exterior can also serve as a handsome wall for a porch. Afternoon light filters through screening to lend a hazy glow to a cozy seating area. An overhead fan/light keeps things comfortable on muggy days, and speakers discretely mounted near the ceiling fill the room with sound or provide gentle background music. 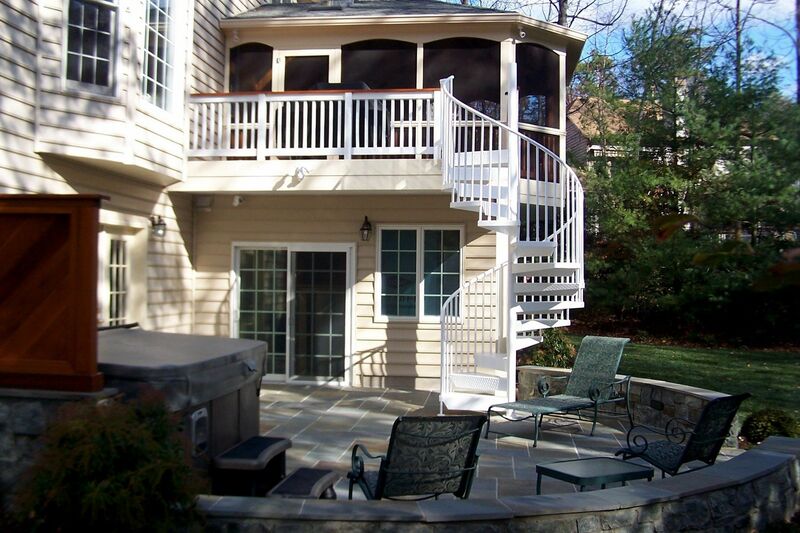 A spiral staircase leads to a second-story screened porch. What Size Deck Should I Have?